For nearly 30 years, David has provided strategic and tactical life science marketing expertise in the pre-clinical and clinical research, drug development, medical device and life science sectors. He has a keen understanding of scientific and medical concepts and a proven ability to translate them in ways that improve sales and marketing alignment and that can be applied to communications of all types, including lead generation campaigns, content marketing and other thought leadership initiatives, websites, videos, brochures, and more. 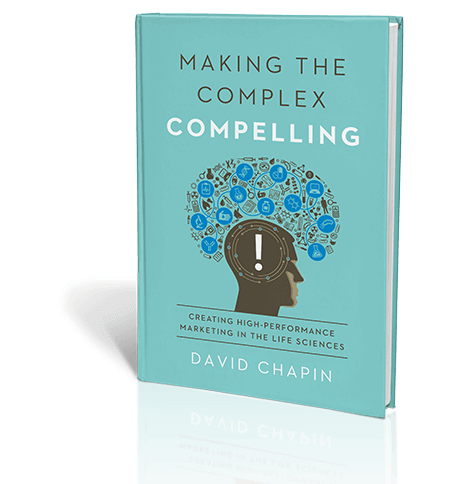 Author of Making the Complex Compelling: Creating High-Performance Marketing in the Life Sciences. David has written extensively over the last 10 years on the distinct challenges and opportunities that scientists and life science organizations face in sales and marketing. Scroll down for a partial list of speaking topics, or download a PDF of this page. What are your Reasons to Believe? Download a PDF version of David’s bio and speaking topics.